Proceeds from NHLPA-supported auction will go to the Gord Downie Fund for Brain Cancer Research & the Gord Downie Secret Path Fund for Truth and Reconciliation. TORONTO (Oct. 18, 2016) – The National Hockey League Players’ Association (NHLPA) is pleased to announce that Braden Holtby’s Team Canada goalie mask from the World Cup of Hockey 2016 has raised over $27,000 (CDN) for the Gord Downie Fund for Brain Cancer Research and the Gord Downie Secret Path Fund for Truth and Reconciliation in honour of Gord Downie, The Tragically Hip lead vocalist and lyricist. 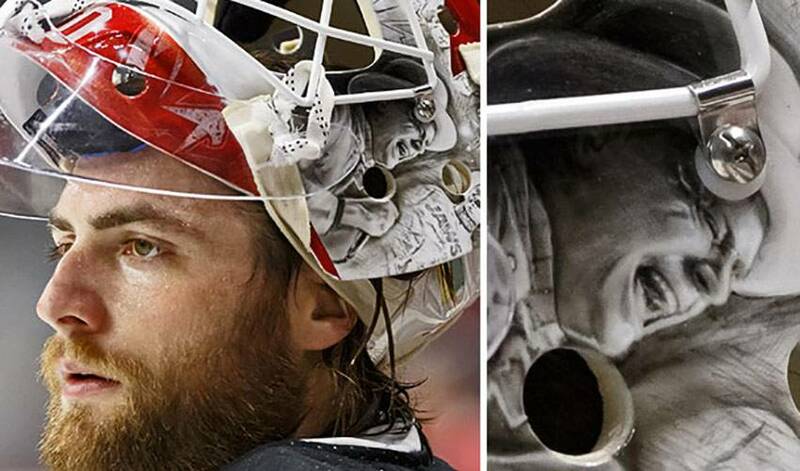 Holtby’s mask features the unique maple leaf crest of the Team Canada jersey on the right side, and the image adorning the left side is a collage of Canadian music icons, The Tragically Hip. Moved by The Tragically Hip’s record-setting performances in the summer, which followed their announcement of Downie being diagnosed with a primary brain tumour, Holtby commissioned the design and painting of his mask by Swedish artist David Gunnarsson at DaveArt Studios. He later came up with the plan to offer his one-of-a-kind mask for auction to fans across Canada and the world. The NHLPA hosted Downie for a World Cup of Hockey 2016 game on Sept. 20 where he met Holtby following Team Canada’s game versus Team USA. The proceeds raised from this auction of Holtby’s goalie mask will support two foundations, the Gord Downie Fund for Brain Cancer Research at The Sunnybrook Health Sciences Centre where Downie is currently being treated; and the Gord Downie Secret Path for Truth and Reconciliation, which will support the National Centre for Truth and Reconciliation’s initiatives at the University of Manitoba, providing preservation and education on the historical significance of Canada's abolished First Nations Residential Schools program. Holtby’s mask was listed on Auctions.NHL.com from Sept. 20 until Oct. 10, with the assistance of the National Hockey League, Fanatics Authentics, and Commerce Dynamics.